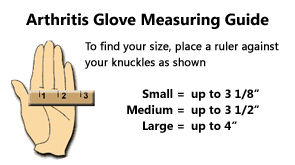 * Size: Small to 3 1/8" Medium to 3 1/2" Large to 4"
IMAK’s® Arthritis Gloves are designed to help relieve aches, pains, and stiffness associated with arthritis of the hands. The Arthritis Gloves are made of soft, breathable cotton Lycra®, meaning they are comfortable enough to wear all day and night. The open fingertips allow you complete freedom to feel, touch and grip, so you can perform daily tasks without issue. Use IMAK Arthritis Gloves to relieve arthritis, hand fatigue, cold hands and other types of hand and wrist pain. May also help with neuropathy of the hands and poor circulation. One PAIR per box. Coverlet® Adhesive Oval Bandage, 1-1/4"